Provide your feedback on the potential alternatives. A set of public meetings are being held during winter and spring 2018 to continue a conversation with residents about a potential connection between Hazelwood, Greenfield, Four Mile Run, and Oakland. Building off of the conversation about the planned stormwater improvements, a number of transit routes and options are being considered to improve the connection between these neighborgoods and the major employment centers of Oakland and Downtown; this current study responds to prior studies that highlighted a need for connectivity through this area. The intention is to implement this transit solution simultaneously with the stormwater improvements to maximize efficiency and minimize cost and disruption to residents. This connection is intended to provide an alternative to vehicular traffic, and to supplement the public transit system in the area, providing an additional mode of travel to and from major employment centers. With that in mind, the goal of this process is for community members to weigh in on the transportation routes and technologies that best complement the goals of the immediate neighborhoods. 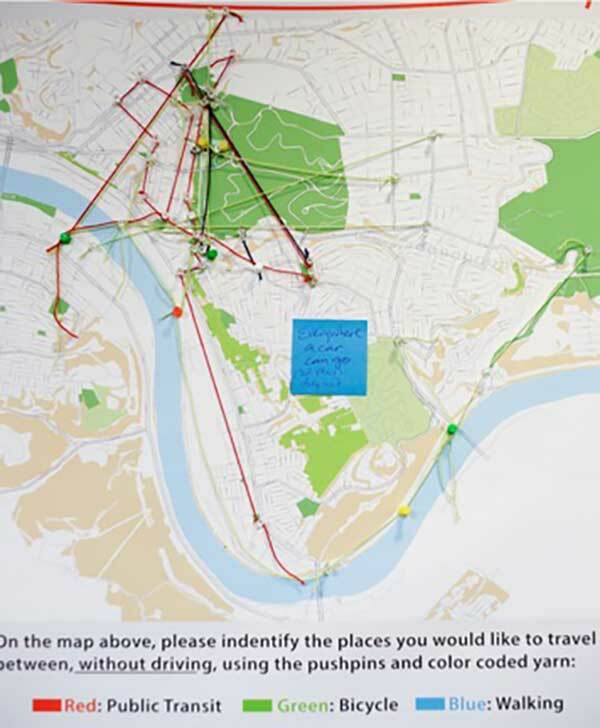 The neighborhoods within the study area for this effort include Hazelwood, Greenfield, Pather Hollow, Four Mile Run, Squirrel Hill, and Oakland. The approximate study area is highlighted on the map below in green. The chosen mobility solution will build on the PWSA Green First Infrastructure Plan, which calls for green infrastructure to mitigate flooding. We recognize that the two major sewers that converge at the bottom of the Four Mile Run Watershed contribute to significant flooding, which has impacted residents and businesses in the neighborhood for many years. PWSA has identified a solution and allocated resources to implement the recommended mitigation measures; this study's outcome is intended to align with the construction schedule for the stormwater improvements. By taking on these projects together, we hope to maximize efficiency and minimize costs and disruptions to residents. Downloads: A presentation and notes from the previous November 2017 meeting are, along with the PWSA Green First Infrastructure Plan, available to download below. 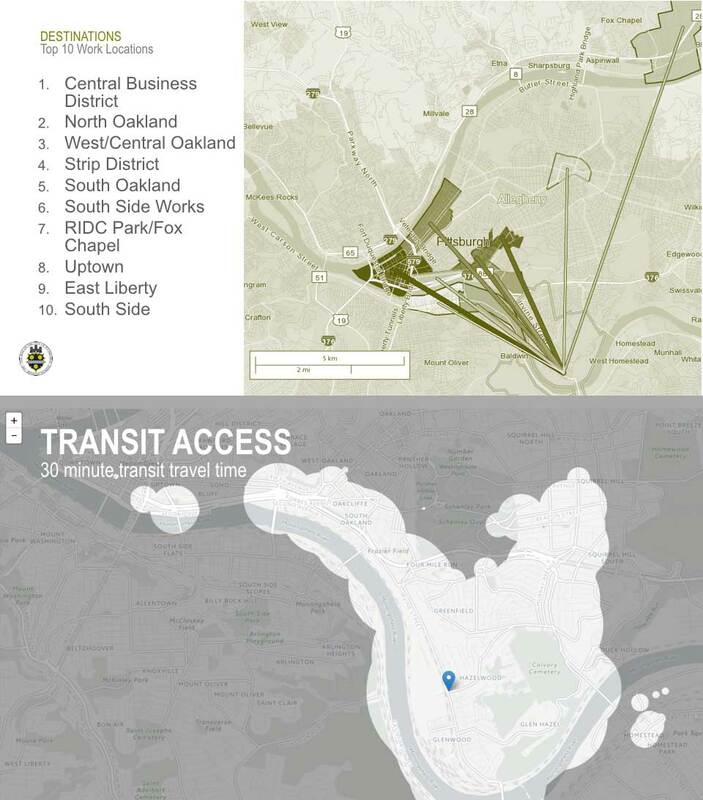 Cost burden of transit: the existing transportation options disproportionately burden these neighborhoods, which have higher average unemployment and lower average incomes than the rest of the city (the average household income in ZIP code 15207, which includes Hazelwood, Greenfield, and Glen Hazel is $39,886, compared to a $52,499 for the City of Pittsburgh as a whole). Needed connections to employment centers: without transit to employment centers, or with limited transit choices to where they work, neighborhood residents contend with long commutes or a lack of overall access. A set of public meetings were held to inform this mobility study; presentations from those meetings are posted below. We have provided a few of ways to provide feedback on this project, both in person and electronically. Also had a series of smaller stakeholder meetings with key stakeholders and the immediate neighborhoods included in the study area. Study Timeline: This set of public meetings began with an initial community meeting in November 2017, and continued with a second meeting in January 18th, 2018 and a third meeting on February 20th, 2018, and a fourth meeting on May 22, 2018. Here's a timeline of this study and the goal of each public meeting. The second public meeting was held on January 18, 2018; the presentation from the January 18th meeting is posted below. Presenters included the City of Pittsburgh’s Department of Mobility and Infrastructure, the Squirrel Hill Urban Coalition, Oakland Planning and Development Corporation, and The Run Resident Action Team. The consultant team from Michael Baker International then presented design alternatives for the route and mode of transportation. Subscribe to our mailing list to be the first to hear about upcoming public meetings.